I attended Google Next last week, filled with many announcements on GCP and G Suite. 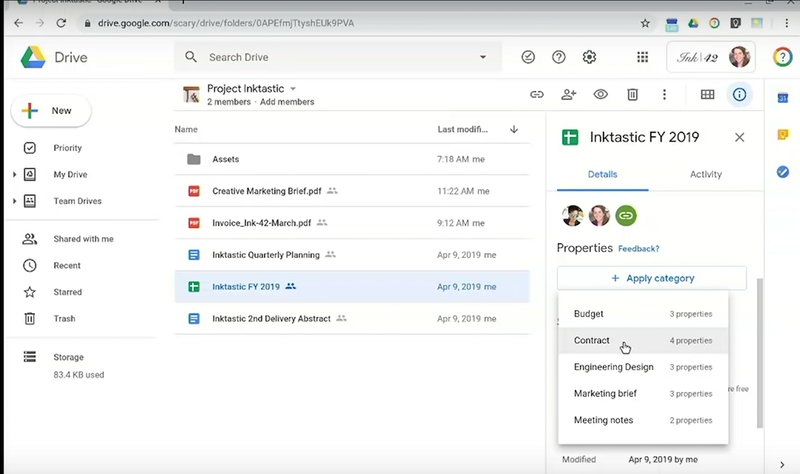 You can read this post from the G Suite Updates blog for a list of the main announcements related to G Suite. Showcasing several new features available between today and the end of the year. 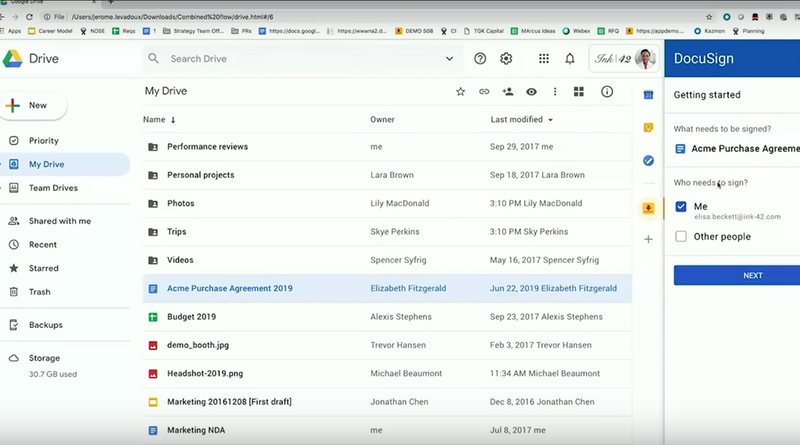 Showcasing metadata and workflow features in Drive, plus new Drive add-ons. Mostly focused on the cost savings made possible by migrating your file servers to Google Drive. 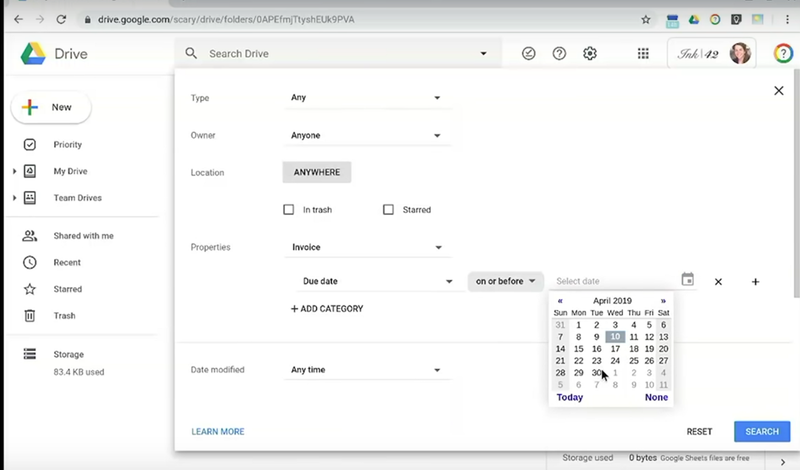 During the session on workflow features with Airbus, Google made a demo of the new metadata feature available in beta (you can apply here) and it looks quite useful! 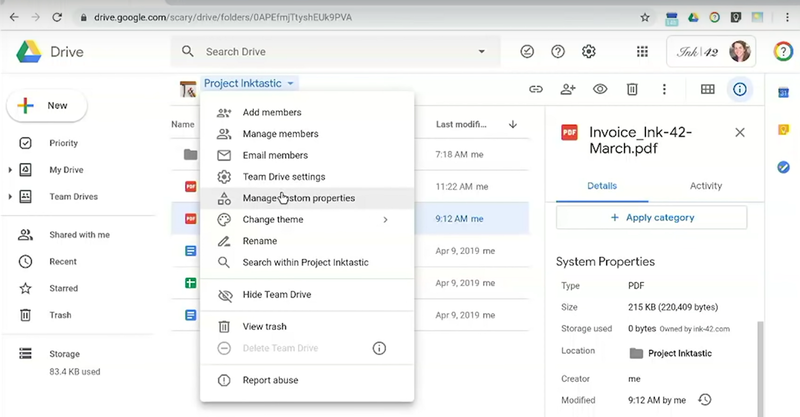 Team Drive users can select files and apply categories to them. They can then add the proper informations about the file. And those properties can be reused in search! eg here, search for all invoices where due date is before a specific date. Google also talked about automated document classification, though nothing specific has been shared yet. 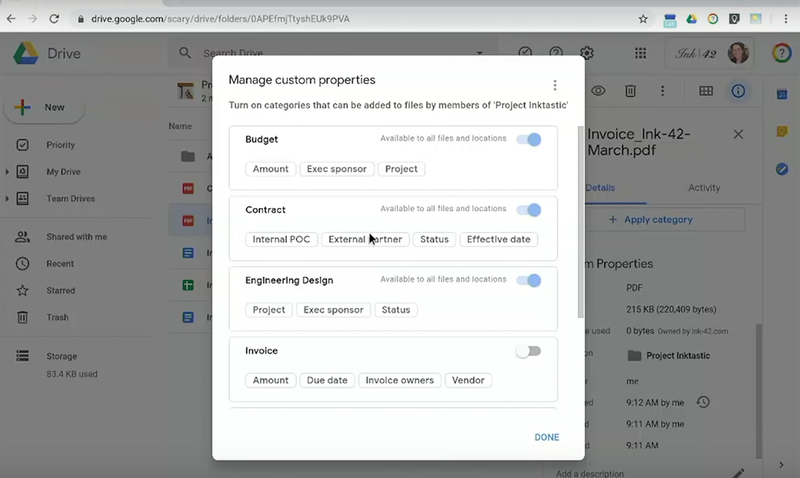 At the moment the goal seems for Google to provide basic approval processes while more complex workflows will be made available via third-party integrations, thanks to the new Drive add-ons. Basic approval workflows, available in beta in June 2019. 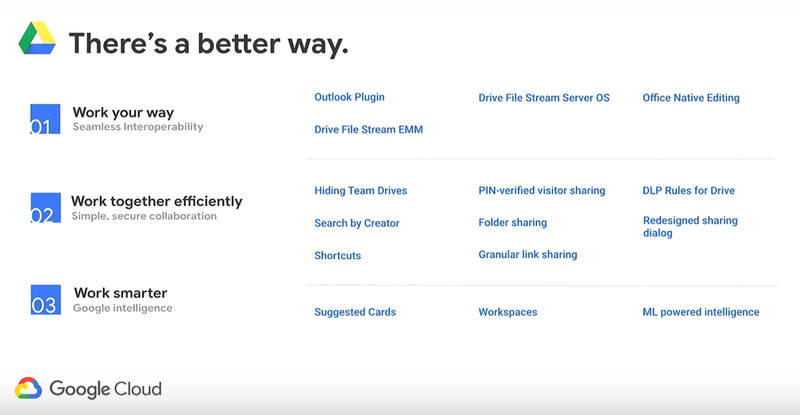 New Google Drive add-ons will provide more complex workflow features, directly in Drive. Here’s a signature process powered by DocuSign. At the moment, the main limitation of Team Drive is that you can’t change permissions on subfolders (though you can share specific files to people who are not members of the Team Drive). 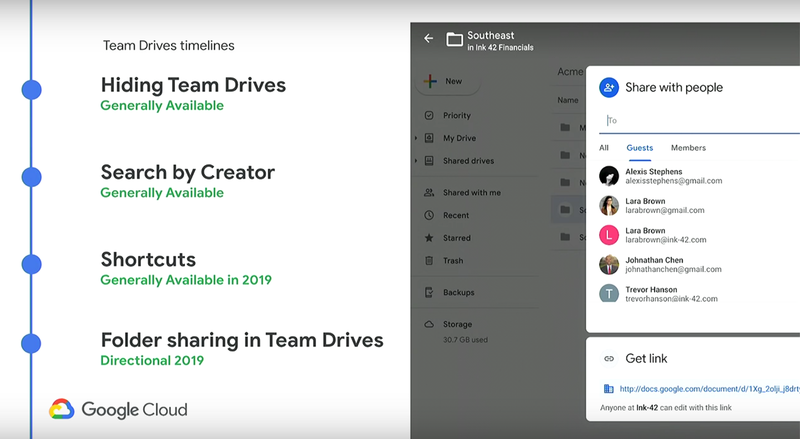 This should change later this year, though Google made no promise (it’s still announced as “Directional” because it seems to require a lot of work on the backend structure of Drive). Until now, if you had a Microsoft Office file in Drive, you needed to convert it to Google Docs to edit it and then convert it back (using “Download as”) if you needed to share it in the Office format. 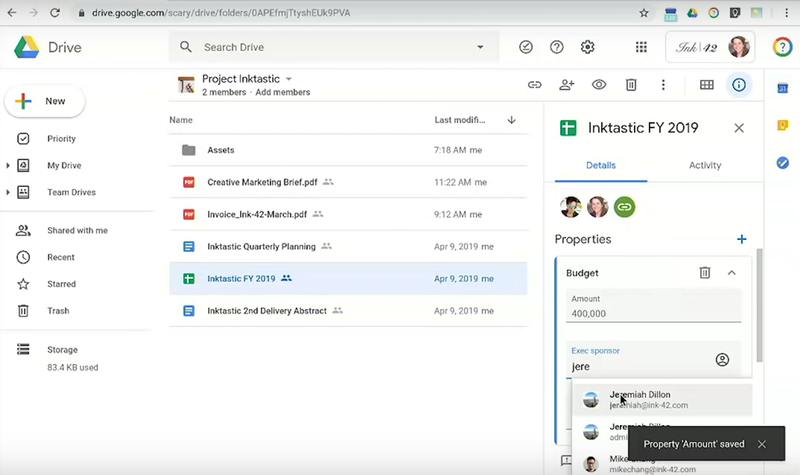 Now you can directly edit your Office files (Word, Excel and Powerpoint) without conversion, meaning it will be way easier for people to collaborate. 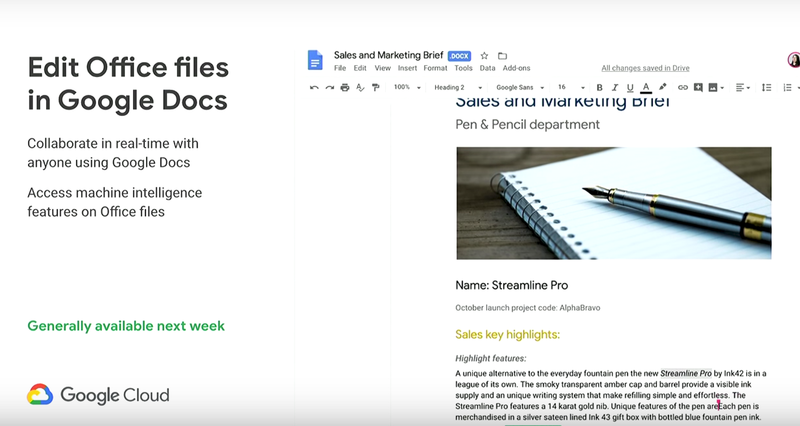 Note the “.DOCX” icon right next to the document title, showing you are editing in Google Docs a Word document and not a standard Google Doc. It’s especially useful if you have started to migrate the content of your files servers to Google Drive without conversion. Some users might edit those files using Microsoft Office and Drive File Stream while others without access to Microsoft Office will be able to edit and collaborate on the same files. 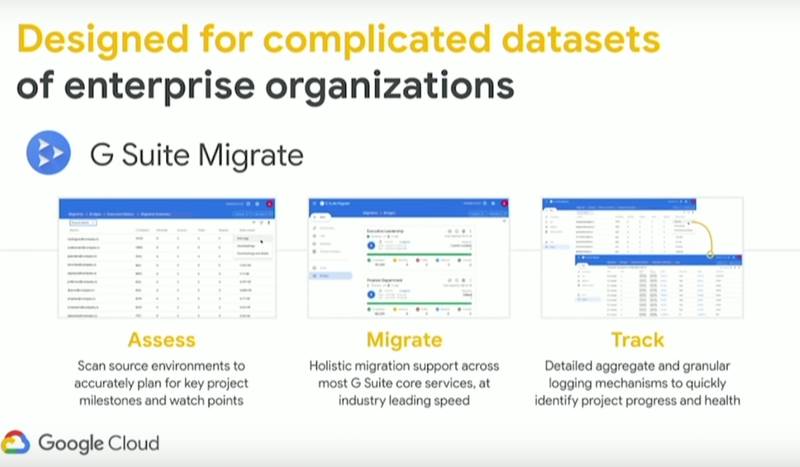 G Suite Migrate was announced in March and is available as part of a beta program, it lets you migrate different data to G Suite, including files from Sharepoint, OneDrive and files servers to Google Drive. Google showcased again the ability to share files to non-Google accounts via PINs. This was previously announced last december. 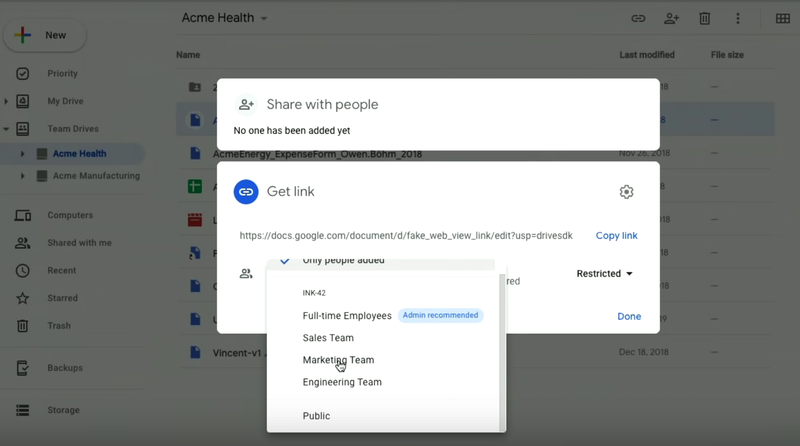 They also mentioned a redesign of the sharing dialog and the ability to restrict sharing to subparts of the organization (rather than making a file or folder available to anyone within the organization).